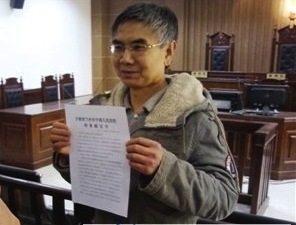 All charges of inciting subversion against the blogger Chen Pingfu, were dropped by local procuratorate on Friday in Lanzhou, Gansu Province, leading the government critic to declare it was a victory for free speech in China. "My articles might harm the image of government but it is not wrong to expose the dark side of the social system," Chen told the Global Times, adding that he believed the end of his house arrest is evidence that freedom of speech is protected in the country. Chen said he had been under house arrest since the Lanzhou People's procuratorate charged him with subversion of State power on August 14. The case first went to trial on September 4 but proceedings were postponed three times at the request of the local procuratorate, which finally dropped the charges on Friday, Beijing News reported. He Huixin, Chen's lawyer from the Lanzhou-based Rongqing Law Firm, told the Beijing News that the dismissal is a victory for the rule-of-law but added he was disappointed the Procuratorate did not provide its reasoning for withdrawing the case. The Lanzhou Intermediate Court and the procuratorate could not be reached Tuesday. Chen, 55, is a former math teacher who suffered a heart attack in 2005. After surgery Chen could not afford to pay his medical debts and in 2008 he lost his teaching job when the state factory-affiliated college he worked for closed. To pay his son's tuition and his medical bill Chen was reduced to playing violin on the streets of Lanzhou until the city's Chengguan, or urban management officers, stopped him. "Those experiences strengthened my belief in safeguarding freedom of speech," said Chen, who started to write blogs in 2007 to express his dissatisfaction toward the unfairness of the current system and the wrong doings of the local government. The articles caught the attention of local police and were deemed by the local procuratorate as evidence that Chen had committed subversion.